The Fresno Home Plan combines all the elegance one would expect in a Mediterranean design along with a functional and comfortable layout perfect for entertaining friends and family. With a luxurious Master suite, large island kitchen, a study that could easily become a 5th bedroom and elaborate ceiling designs throughout, this home plan features many attractive amenities including an outdoor kitchen with bar, plenty of windows for natural light and multiple glass sliders that pocket out of view for a seamless transition to the covered lanai. 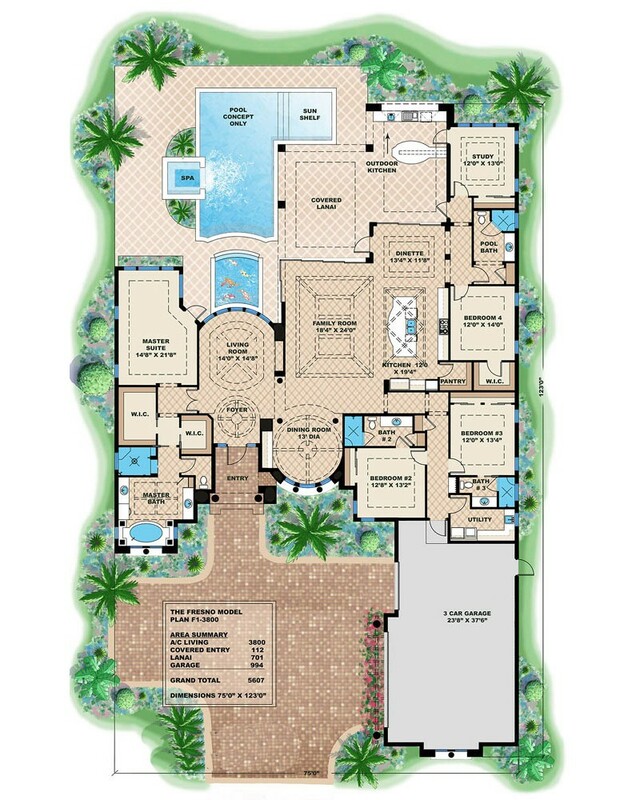 If you are looking for your dream home, look no further than the Fresno Home Plan. Designer hereby reserves its common law copyright and all other property rights in these plans, ideas, and designs. These plans and designs are not to be reproduced, copied, or changed in any form or manner. These plans and designs are not to be assigned to any third party without first obtaining the express written permission of the designer. This plan will still need to be engineered by the local engineering company and truss drawings done as well for most locations. This includes all of Florida. This plan is not for sale for use in the following areas without the written consent of the designer: Collier County, Florida; Lee County, Florida.